December 23, 2018 November 25, 2018 by Robert Ortiz-Abreu, Jr.
We have a new web page on AGCRA.com that is dedicated to the history of the AG Corps and AGCRA. Historical posts can now be found under the “News & Publications” button at the top of our Home Page (click History). This portion of the Association’s web site will capture articles and historical events that walk us through our AG Corp’s history, prestige, culture and relevance to the Army and the Nation, as well as how the AGCRA was created and thrives today. We also request that our prominent “Grey Beard” population contribute their stories when they were in uniform to provide a more personal perspective of our Corps’ distinguished past from those who walked before us. Grey Beards can tell their story by submitting their respective article to Adjutant@agcra.com or History@agcra.com. 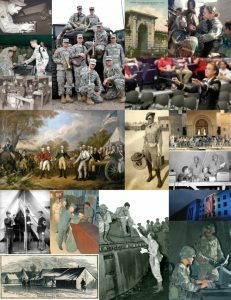 The historical AG Corps and AGCRA articles posted on the History web page should resonate with all Army HR professionals, both Soldiers and Civilians, whether you serve in a support role of maintaining personnel readiness and preparing units to deployed, to the execution of direct HR support across the force either in garrison or in combat.